Illinois Personal Injury Punitive Damages | Hupy and Abraham, S.C.
Can I recover punitive damages if I’ve been hurt in an Illinois personal injury accident? Whether you’ve been injured in a car crash, motorcycle wreck, by a dog bite, by a prescription medication, or in another type of accident you may be angry. You may want the person or company that hurt you to be punished. In some cases, you may be able to recover punitive damages—or damages that are designed to punish the wrongdoer. Punitive damages are awarded in addition to the compensatory damages that you recover for the harm that you have suffered. However, punitive damages are not available in all cases and they can be difficult to get. An experienced personal injury lawyer can put forth the necessary evidence and advocate for your recovery of punitive damages, when appropriate. One of the Illinois state statutes, 735 ILCS 5/2-1115.05, explains when punitive damages may be awarded, what a plaintiff needs to prove to get punitive damages, and what those damages may include. Clear and convincing evidence is a higher standard than the preponderance of the evidence standard that you use to prove other types of personal injury damages. The clear and convincing evidence standard means that you must prove with a high degree of certainty that you are legally entitled to personal injury damages. How Much Can You Recover in Punitive Damages? Punitive damages are only allowed if you were hurt and you can recover personal injury damages for things such as medical expenses, lost income, out-of-pocket costs, pain and suffering. 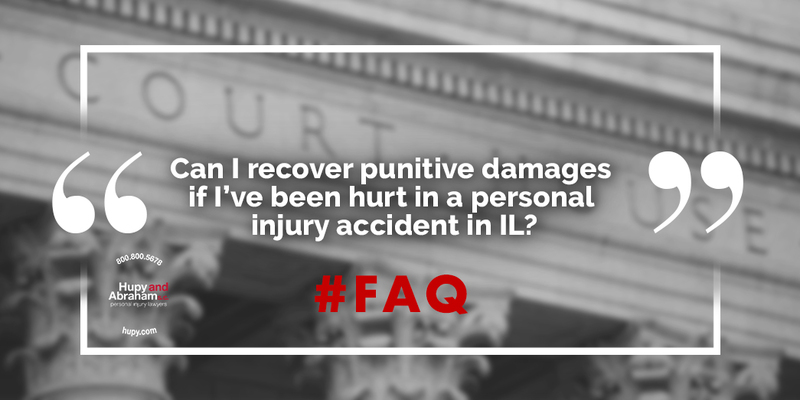 The amount of punitive damages that can be recovered is limited by Illinois law to three times your economic damages. Punitive damages can be hard to prove and difficult to recover, but they may be important to you personally and for public policy reasons. Accordingly, if you believe that you have a case that could include punitive damages then we encourage you to contact an experienced personal injury lawyer as soon as possible. Contact us online or call us directly at 800.800.5678 to schedule a free consultation about your rights and for more information about protecting your full and fair recovery.